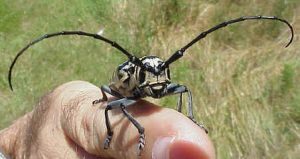 The cottonwood borer is a member of the long-horned beetle family, the Cerambycidae. It is the largest member of that family found on the Great Plains and is indeed one of the largest insects found in North America - up to 40mm long and 12mm wide. During the summertime, we often get phone calls from startled people who have found one and are wondering whether the Martians have invaded! As adults, and as larvae, these insects depend on the cottonwood for their livelihood. The species will also use willows and poplars, but the cottonwood is the tree it prefers. Like all beetles, the adults have chewing mouthparts. They use their large mandibles to eat the leaf stems and new twigs of the tree while they are active during the summer. After mating, the female will chew small pits near the base of the tree and lay her eggs in them. Here is a video of a female beetle in the process of egg-laying. The video was made in Wichita KS on September 5, 2009, by Roy Howard. The larvae burrow into the tree and may take two years to mature in cooler climates. Their first year is spent feeding on the roots of the tree and the second burrowing through the heartwood near ground level. They pupate for about 3 weeks during April-June before emerging to complete their life cycle. The puparium is located in a root below ground level. After completing metamorphosis, the adults chew their way out and then dig they way up to the ground surface. Consequently, they don't leave visible emergence holes on the tree. Cottonwood borers are a native species and should not be confused with the Asian longhorned beetle (ALB), a species that has been imported accidentally into the U.S. in the New York City and Chicago areas. Nonetheless, people should know how to recognize the ALB and report it to the local authorities if they find one. The Asian longhorned beetle DOES leave a visible exit hole in the bark of the tree that is about the size of a dime. 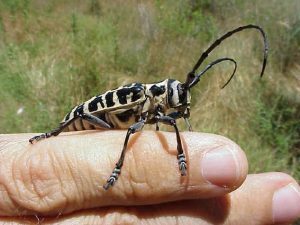 The antennae of the cottonwood borer are solid black while those of the Asian longhorned beetle have white bands on them. The website linked from the image below has comparison photos of these two species as well as several other kinds of insects that might look similar. Click on this image to learn more about the Asian longhorned beetle! Visit the Asian Longhorned Beetle website by the University of Vermont Entomology Research Laboratory. The bold coloration of the cottonwood borer is due not to colors in the exoskeleton, but rather to masses of small white hairs, which are only visible with magnification. The pattern they make is unique to each beetle, like a fingerprint. Cottonwood borers are found throughout the eastern U.S. and range as far west as the high plains of southeastern Colorado. Viewed head-on, the large mandibles of the cottonwood borer are very visible. They can bite if mis-handled! They may also make a little buzzing/hissing sound when handled. Their antennae are about as long as the body, and they have a prominent spine on each side of the thorax. If you find one and want to study it, it can be kept for a few days in a small container. Feed it tender new leaves (cottonwood of course! ), provide it with a little water, and marvel at this "alien" in our midst! Should you worry if you find them on your property? Small cottonwood trees that suffer a large number of the larvae can become sufficiently weakened to break off at ground level in high winds. The adults may also cause malformation of new branches by feeding on the tender new growth. Large trees probably won't suffer significant harm by them. If you have questions about control of these beetles on your property, please read the following. If you have any further questions, I recommend contacting a local garden center, your county extension agent or a pest control agency. "Trees under stress and planted on poor sites suffer attack more often than healthy trees. Therefore, proper site selection, irrigation and fertilization are important steps to reduce injury. Small larvae can be dug out from the base of the trees in early September using a pocket knife. Chemical control is based on preventing the adults from laying eggs. Thoroughly spray the lower trunk and saturate the soil around the base of the tree in late June or early July, and again late in July with permethrin. Though there are many homeowner products with permethrin, most do not have a wide borer label. One that does is Hi-Yield Garden, Pet and Livestock Insect Spray."